Creative IT provides an expert SSD data recovery service for data that hasn’t been backed up but is no longer accessible on a G-DRIVE mobile SSD R-Series. From our central London location data recovery centre, we offer fast, secure and confidential data recovery services with a high success rate for all G Technology™ hard drives and SSD. We assist all types of users including photographers, home users, students and businesses faced with issues with their G Technology mobile SSD. We recover data on all the R Series range, including 500GB, 1TB and 2TB models when they have stopped responding, avoiding catastrophic loss of data. What causes the failure of a G-DRIVE mobile SSD R-Series? A SSD is a storage device that does the same as a standard hard drive but doesn’t have any moving parts. It uses integrated circuit assemblies as memory to store data persistently. 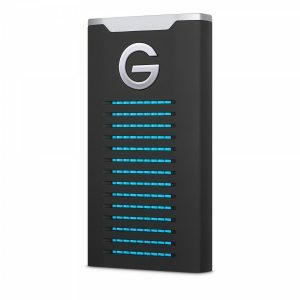 Although G Technology has designed its rugged G-DRIVE mobile SSD R-Series for added durability and high performance, failures can happen, leaving users unable to access their important files, photos or sensitive work documents. The most common failures on G-DRIVE mobile SSD R-Series are issues with faulty internal components that lead to electronic failures or bad connections on soldered parts. Loss of data can also be caused by a corruption of the data stored due to bad sectors or viruses. Finally, firmware upgrades that fail can stop the SSD from working. In all these situations, a professional SSD recovery service will assist in restoring the data back without any loss. As the leading data recovery company in London, Creative IT offers same day and cost-effective data recovery services for all G-DRIVE mobile SSD R-Series. Our skilled and professional technicians have been trained to deal with all the latest development in drive technology and understand the significance of data. We endeavour to do everything we can to ensure the complete recovery of your information and give you back the access to the data stored on your SSD in a timely manner.